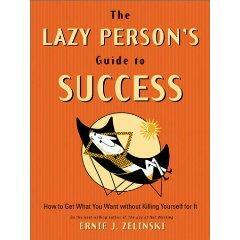 1 edition of The Lazy Person's Guide to Success found in the catalog. Add another edition? Are you sure you want to remove The Lazy Person's Guide to Success from your list? Published October 2002 by Ten Speed Press in Berkeley, California . In our workaholic world, we are in desperate need of reminders that the most valuable, productive, and enjoyable moments in our lives are usually those we spend doing the least. ERNIE ZELINSKI''s secret of success is so simple you will wonder why you never thought of it yourself: work less, think more. 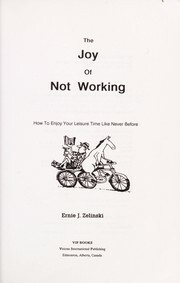 In the best-selling THE JOY OF NOT WORKING, Ten Speed Press and VIP BOOKS author Ernie Zelinski extols the freedoms of joblessness; in THE LAZY PERSON'S GUIDE, he shows how to make work more fulfilling and relaxing by redefining success in terms of happiness. Two books in one, the first for the lazy achiever and the second for the truly lazy achiever, this quirky little guide combines humor and wisdom to provide plenty of reasons to sit back, kick your heels up, and use the power of creative loafing to get the most out of life. 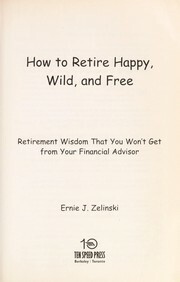 Note: Ernie Zelinski writes on retirement planning, friendship, money, fun things to do at work, retirement jobs, The Joy of Being Retired, Real Career Success , Creativity and Innovation and Dream Careers and UnReal Jobs. In our workaholic world, we are in desperate need of reminders that the most valuable, productive, and enjoyable moments in our lives are usually those we spend doing the least. Chapter 5: You Have the Money, But Can You Buy Some Time? 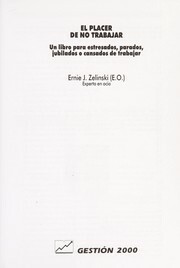 Published in Russian by Prime-Evroznak, St Petersburg, Russia. December 13, 2009 Edited by 207.81.129.40 Edited without comment. February 22, 2009 Created by 206.108.153.219 Edited without comment.